There are also just 1.82 million existing homes for sale nationwide — the fewest since January 2001, and a 22 percent reduction from one year ago. With buyer demand high and home inventory down, home prices are likely to rise in South Orange County and nationwide throughout 2013. After a small decline in September, Existing Home Sales rebounded in October, increasing a modest 2.1%. The housing market’s slow, steady recovery continues as sales volume in all four regions expanded last month with the exception of the Hurricane Sandy-affected Northeast. The National Association of REALTORS® monthly Existing Home Sales Report comprises completed sales of single-family homes, townhomes, condominiums, and co-ops. The Existing Home Sales report is compiled on a seasonally-adjusted, annualized basis. It shows a 10.9 percent sales increase as compared last year. Sales volume might otherwise be higher, however, if not for a lack of homes for sale. Total housing inventory fell 1.4 percent to 2.14 million homes last month which, at the current sales pace, represents a 5.4-month national supply — the lowest in more than 6 years. The lack of supply amid burgeoning demand has led home prices higher nationwide. October’s median existing home sale price was $178,600 — an 11.1% increase from October 2011 and the eighth consecutive month during which the median sales price rose. The last time that occurred was during the eight months ending May 2006. In addition, the Existing Home Sales report showed that the median time on market in October rose to 71 days, up 1 day from September 2012. As compared to October 2011, however, median time on market is down 26% from 96 days. Furthermore, thirty-two percent of homes sold in October were on the market for less than one month. 20% were on the market for six months or longer. Record-low mortgage interest rates continue to spur housing, as do low prices. Neither will last indefinitely. If you plan to purchase a home in South Orange County in 2013, therefore, consider moving up your time frame. Home ownership will likely increase in cost as the year moves on. For today’s South Orange County home buyer, September’s Existing Home Sales report may be a “buy signal”. With home supplies down and demand for homes rising, home prices are poised to increase through the last three months of 2012 and into the start 2013. 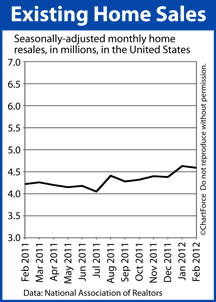 Home resales climbed 2% last month as the housing market continues its measured, steady recovery. According to the National Association of REALTORS®, Existing Home Sales rose to 4.47 million units in July on a seasonally-adjusted, annualized basis. An “existing home” is a home that cannot be classified as new construction and, despite a reduction in the national homes inventory, the number of previously-occupied homes sold in July was higher by 10% as compared to one year ago. In addition, the real estate trafde group reports that distressed sales accounted for a smaller percentage of the overall home resale market in July. Just 24% of home resales were for homes in various forms of foreclosure or short sale. This is down one percent from June, and five percent from July 2011. It also marks the smallest percentage of homes sold in “distressed” status since the trade group began to track such data 4 years ago. 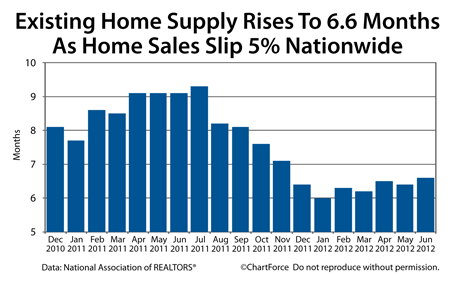 Lastly, nationwide, the supply of homes for sale dropped to 6.5 months. At the current pace of sales, therefore, the complete U.S. home resale inventory would be sold by the end of Q1 2013. There are now 2.40 million homes for sale — a 24% reduction from July 2011. With home inventory low and mortgage rates the same, a slowing fall home resale market will probably look ripe for better deals – for buyers. For anyone who’s been on the fence, looking for an optimal buying moment, the time between now and the middle of January 2013, just might be that time. Home resales slipped a little more than 5 percent last month, putting a slight damper on recent housing market enthusiasm. Low mortgage rates and rising rents in South Orange County and in many U.S. cities continue to fuel the U.S. housing market. Home buyers should expect higher home prices ahead. Home resales slipped last month; a slight setback for the nation’s housing market’s recovery. According to the National Association of REALTORS®, Existing Home Sales fell to 4.55 million units in May 2012 on a seasonally-adjusted annualized basis, representing a 2 percent drop from April. An “existing home” is a home that’s been previously owned or occupied, and cannot be categorized as new construction. Despite May’s retreat, however, as compared to last year at this time, Existing Home Sales by units are higher by 10 percent. In other words, like everything else in housing, the long-term statistical trend has been a positive one. The housing market has seen its bottom and is finding balance. In addition, distressed sales accounted for 25% of all sales in May, down from 28% in April. “Distressed sales” include the sale of homes in various stages of foreclosure, and of short sales. This is the smallest percentage of homes sold in a “distressed” status since the real estate trade group began tracking the data in 2008. And, lastly, home supplies rose by 0.1 months to 6.6 months nationwide in May. 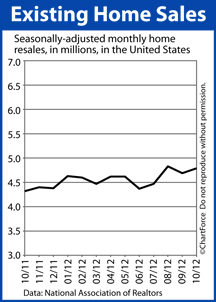 This means that, at the current pace of sales, the complete U.S. home resale inventory would be sold out before the end of 2012. A 6-month supply is widely believed to represent a market in balance between buyers and sellers. There are now 2.49 million homes for sale — a 20% reduction from May 2011. 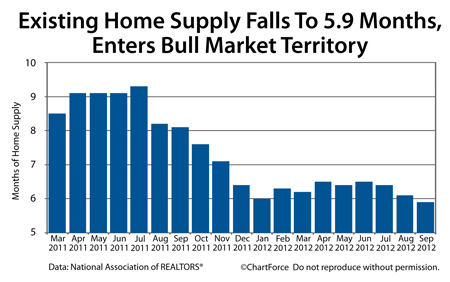 Home resales may have slipped last months but volume remains brisk nationwide. All-time low mortgage rates and high home affordability are keeping buyers in the market. Home prices are rising in many U.S. cities as the housing market continues its slow, steady recovery. Low mortgage rates are helping to make homes more affordable. It appears home buyers have taken notice. According to the National Association of REALTORS®, Existing Home Sales rose 3.4% in April from the month prior, registering 4.62 million homes sold on a seasonally-adjusted, annualized basis. An “existing home” is a home that’s been previously occupied. April’s sales volume represents a 10 percent jump from April of last year. For buyers and sellers in Rancho Santa Margarita , the April Existing Home Sales report supports the notion that the housing market may be improving; that the “bottom” occurred sometime in late-2011. Home values have been rising in many U.S. markets and home builders now report the highest levels of foot traffic through models since 2007. Demand for U.S. housing is growing. It also helps that home affordability is at an all-time high. Not in recorded history have this many homes for sale been affordable to buyers earning a moderate household income, on a percentage basis. Additionally, there is now a larger stock of homes from which buyers can choose. In April, the number of homes for sale nationwide jumped 9.5 percent to 2.54 million — the largest home resale inventory of the year. 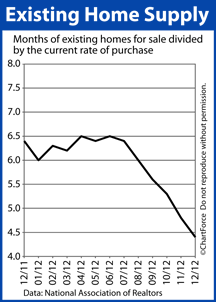 At the current pace of sales, it would take 6.6 months for the complete home inventory to sell. Analysts consider a 6.0-month supply to be a market in balance. Anything less than a 6-month supply suggests a “buyer’s market”. Home values peaked nationwide in April 2007. Since then, it’s been an uneven recovery. Some markets came back quickly, while others did not. On a neighborhood-by-neighborhood basis, even, there’s signifcant variance in how home values have fared. In other words, although the April Existing Home Sales report indicates housing strength nationally, it’s the local data that matters most to today’s buyers and sellers. To get real-time real estate data for a particular street or area, talk with a local real estate agent. In March, for the second straight month, home resales slipped nationwide. According to the National Association of REALTORS®, March 2012 Existing Home Sales fell to 4.48 million units on a seasonally-adjusted annualized basis — a 3 percent drop from February. An “existing home” is a home that’s been previously occupied or owned. The weaker-than-expected Existing Home Sales data is the third such housing report this month to suggest a lull in the spring housing market. Earlier this week, homebuilder confidence slipped for the first time in three months and March Single-Family Housing Starts fell, too. The news wasn’t entirely bad for home resales, however. Although total home units sold decreased, so did the number of homes available for sale. There were just 2.37 million homes for sale nationwide in March, a 2 percent drop from the month prior. At the current pace of sales, therefore, the entire nation’s home resale stock would “sell out” in 6.3 months. This is the second-fastest pace since the housing market’s April 2007 peak. A 6-month supply is widely believed to represent a market in balance between buyers and sellers. The March Existing Home Sales data shows that — despite record-low mortgage rates nationwide — buyer activity in Rancho Santa Margarita is slowing, and seller activity may be slowing, too. So long as the two forces remain in balance, home prices should do the same. This is the law of Supply and Demand at work. However, if home sales continue to slide and home inventory builds, buyers may find themselves with an edge in negotiations. 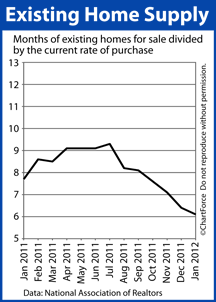 If you’re planning to buy a home in 2012, the long-term housing trend is still toward recovery. This season may be a good time to look at your options. Talk to your real estate agent to see what’s available. Low mortgage rates may persist, but low home prices may not. Even accounting for last month’s high contract failure rate,though, the Existing Home Sales report still posted its second-highest reading since May 2010. For today’s Trabuco Canyon home buyer, the data may be a “buy signal”.